I have always loved visiting churches. We didn’t visit churches much on vacations when I was growing up, probably because my dad is an atheist. I do remember visiting what looks like Bruton Parish Church in Colonial Williamsburg in 1979 and The Cathedral of St. John the Divine in 1988. And while it’s not Notre Dame de Paris, or even York Minster (as I was reminded several times by another transplant), I do love San Fernando Cathedral. I’m sort of an amateur tour guide and San Fernando Cathedral is on nearly every tour I give of the city. The cathedral was originally the parish church for the colonists from the Canary Islands, who arrived in 1719. The first stones of what was then called Nuestra Senora de Candelaria y Guadalupe (and which is now San Fernando Cathedral) were laid in the early 1700s. I have seen numbers ranging from 1729 through 1738. And, by the way, both aspects of Mary the Mother of Jesus, as Our Lady of Candelaria and as The Virgin of Guadalupe, still have their places in the cathedral. Beginning in 1868, the building, which had fallen into disrepair, was fixed. In addition, the church was enlarged and the Gothic front was added. One tower was finished decades before the other, and in 1874, the church was designated a cathedral. You can still see the original church if you go around to the Military Plaza side of the building. In 2003, the cathedral underwent a major renovation to stabilize the foundation. Additionally, according to news sources at the time, the Second Vatican Council recommended placing the altar closer to the congregation. In aid of this, the altar was moved from the front of the church to the center of the church and the seats were placed in a sort of cross shape around the altar. If you enter the cathedral through the left-hand (viewing from the front) door, you will see a marble casket that says that it contains the remains of Davy Crockett, William Travis, and Jim Bowie. This is one of the most interesting parts of the cathedral for me. 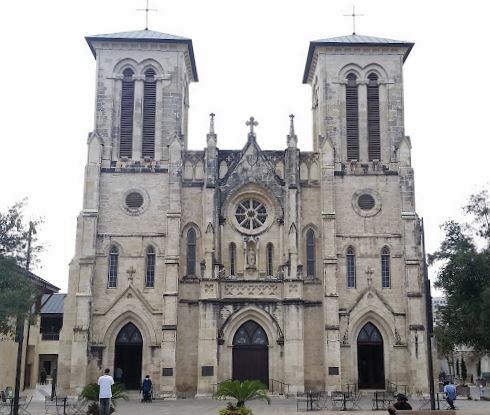 In the last years of his life, Juan Seguin wrote a letter saying that he buried the remains of Crockett, Travis, and Bowie under the altar of the cathedral (which had been a parish church at the time). In 1936, when they were replacing the altar, they did, in fact, find human remains. This caused someone to remember the letter, and so the decision was made that these were, in fact, the remains of Crockett, Travis, and Bowie. The remains were put on display for a year and then placed in the marble casket. While this is a romantic story, however, there is some reason for doubt. For example, it is an established fact that the dead from both sides of the battle were burned on three pyres near the Alamo, and no mention is made of any special considerations being taken for the bodies of those three men. So far as I know, the only fighter on the Texian side whose body was given special consideration was Gregorio Esparza. Esparza’s brother fought on the Mexican side and he got special permission to claim his brother’s body and give it a burial. Additionally, Seguin was not in San Antonio when the bodies were burned, so he could not have separated their remains out from the rest at that point. Additionally, the marker says that “other Alamo heroes” are in the marble casket, so perhaps Seguin didn’t separate the bodies out, but took some ashes from the pyre that the three were supposed to have been burned on. Additionally, the story in the Express said that the bodies were found in three separate graves, and I have found that apparently bodies have been buried in San Fernando Cathedral in the past. Two of these bodies were Simon de Herrera and Manuel Maria de Salcedo. Both had been governors of Texas while Mexico was still part of Spain. During the War for Mexican Independence, one of the battles, The Battle of Rosillo Creek, was fought in 1813 at a location around 11 miles southeast of the cathedral. Following the battle, Herrera and Salcedo, among others, were executed and a priest, Jose Dario Zambrano, took at least Herrera’s and Salecedo’s bodies and buried them in the church. Is it likely that some of the the bodies that were exhumed in 1936 were those of Herrera and Salcedo? Maybe not. Is it possible? Definitely. San Fernando Cathedral is downtown on Main Plaza. The cathedral is handicap accessible.